At the end of the Third Age, the Shire was the most populous country of the Hobbits in the north of Middle-earth. It was founded in the middle of the Third Age by the Bree-hobbits Marcho and Blanco, and gifted to them and their followers by King Argeleb II of Arthedain, within whose borders the land lay at that time. 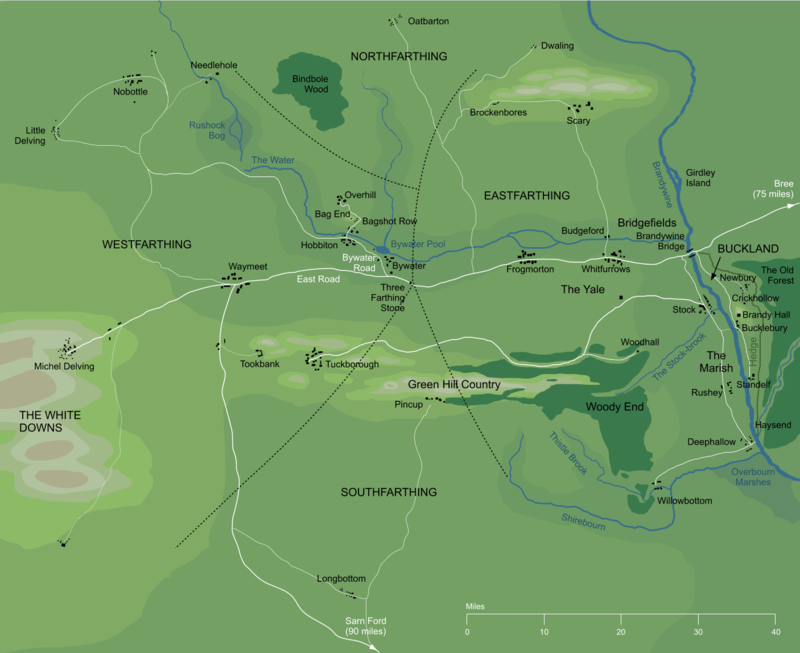 The Shire was divided into four farthings, North, South, East and West; its chief town was at Michel Delving on the White Downs, in the Westfarthing. The Mayor of Michel Delving was accounted among the most important of the Shire-hobbits, as was the Thain (the head of the Took family). The Shire was largely given over to agriculture, and its land was well-suited for farming. One of its chief products was Halflings' Leaf (tobacco), grown especially in the warmer regions of the Southfarthing.